Startup blogs give insights into the startup experience, warts and all! Company blogs often get a bad rap, and for good reason. They can come across as awkward and unnatural as the cross-functional teams that oversee their existence (“Susan, check with marketing and legal before putting that up on the blog, m’kay?”). A few firms simply reprint press releases on their “blogs”. Others severely restrict the topics that staff can blog about, or deliberately hobble discussions with the outside world (including with their customers) by turning off comments. Even companies which “get” digital media sometimes can’t do it right. Google’s official blog posts tend to come across as milquetoast missives that have gone through multiple layers of editing and approval, and commenting is frequently disabled. Microsoft is usually more open to blogging by staff, especially when it comes to reaching out to its development partners or customers of specific product lines, but a lot of its messaging is still communicated via press release and the news media. Apple doesn’t even bother with blogs. But the examples above refer to corporate blogs, or blogs written by employees who work for large companies. In this post, I’d like to talk about startup blogs and small company blogs, as well as a big problem that afflicts a growing number of startup blogs. Before I get to the problem, it’s important to understand a few things about startup blogs. They are different animals than their corporate cousins. Although startup blogs are sometimes written by a marketing director, they are frequently handled by the CEO or co-founders, or by a rotating cast of bloggers on staff. The blogging for In 30 Minutes guides is handled by yours truly, as well as the authors of Online Content Marketing In 30 Minutes and our new LinkedIn book. 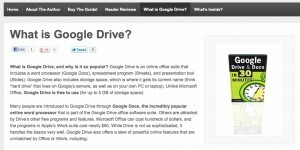 Posts vary in terms of length and target audience, but you can get an idea of the blogging style by looking at these posts about Google Docs new documents and Google Drive shortcuts. Further, I generally find startup blogs to be far more informative than big company blogs. While corporate blogs will sometimes switch to show-and-tell mode with videos or step-by-step instructions, more often than not the big boys like to keep the explanations short and send prospective customers to support sites, product pages, and lead generation forms. For readers, this makes a big difference. Startup blogs tend to have an authentic voice. They will often address market concerns in a direct way or give advice/share knowledge to attract and help new customers. There aren’t layers of editors and approvals to get something published. Sometimes the voice on a startup blog can be brutally honest. Check out this post by Kinvey CEO Sravish Sridhar in which he gives a frank discussion of whether or not to talk about the competition. He lists his competitors — something that corporate bloggers almost never do — and further uses the opportunity to sell to potential customers of the Kinvey Backend-As-A-Service offering for mobile and tablet developers. To anyone who has founded or worked for a startup, the first reason is very understandable. If you’re getting by on just four hours of sleep per night taking care of the business, blogging usually ends up on the back burner until you can find the time to do it. The typical pattern is to see spurts of activity (especially early in the life of the blog) and then long periods of inaction. I suspect that the second and third reasons are often accompanied by a feeling that someone will eventually get around to updating the blog, so for the time being just leave it dangling. The fourth reason may seem strange, until you consider that startups have a high chance of failure. If the hosting is still paid for and the CMS is on autopilot, the old posts will continue to face the world, like the facade of an abandoned business. Regardless of the reason, leaving an untended or derelict blog is a major mistake. An abandoned blog not only looks bad. It can actually call the credibility of the company into question, if the firm is still in business. It tells customers and users that the startup doesn’t care about keeping them up to date, can’t handle the workload, or maybe is distracted by something else, such as consulting, school, or another company. If it’s been more than a year since the last update, prospective customers or users may even wonder if the company is still in operation. Any doubt about the status of the company will of course result in a lower conversion rate, lost sales, or a wasted chance for building partnerships or prestige. In addition, because older content has more prominence, users and prospective customers may be left unaware of the company’s current products, features, pricing, or vision. Consider a company which is still in operation and understands the importance of blogging as a way to connect with customers and serve as an inbound marketing channel (among other uses). But there simply aren’t enough resources to devote to blogging. In this case, the most important thing to do is let people know what’s going on and point them to resources that can help them. Create a short post apologizing to readers and explaining that the blog won’t be updated as you work on the beta/feature X/migration/whatever. You may also want to direct customers to resources where they can find answers (such as a support forum or customer service). Consider pointing them to alternative communications channels — such as a Twitter feed (much easier to update) or some other social networking resource that is regularly updated and/or monitored. Another trick: Start video blogging, either with a Web cam or smartphone camera. It takes less than ten minutes to create a clip, upload it/record directly to YouTube, and then embed the clip on your blog (or refer people to your YouTube channel). It’s not as fast as Twitter and may require some prep to make your office look presentable, but it’s much more efficient than blogging. Longer term, you’ll need to figure out how blogging fits into your company’s communication and content strategies. Some companies with actual budgets bring in consultants to help them talk through these issues, or go out and get a hired gun to handle regular posts. Whatever you end up doing, don’t put off these discussions or plans for too long. It’s important for serving your customers and users, and attracting new customers/users. Schedule some time to talk about this internally or with advisors. If the blog has lots of posts or useful content, do not kill the blog. The content may still be useful to users, some customers and prospective customers, and may still be indexed by Google, which gives your site important visibility to prospective users and customers. Do this instead: Write a final post saying that the blog is being archived at the same location, and current news and information can be found at (other linked resource). But do remove the blog from site navigation, even though the URL stays the same. This will result in less traffic to the blog, but in my opinion it’s better to lose a little traffic than to send people to a resource that hasn’t been updated for months or years. What if the blog has only a few posts? A typical scenario is the startup launched the blog because everyone else did it. After a handful of posts, there was no enthusiasm and the blog was abandoned. In this case, I would consider removing the posts and the navigation links, but only after someone has evaluated how the site has been indexed by Google and linked to by external sites. If you have just five posts, but one of them gets hundreds of referrals per month through links from Hacker News and Google, I would archive it at the same URL per the instructions above. This is Chad, founder of Notifo. I am reaching out today to announce some sad news. Over the past 20 months, Notifo has tried to be the best notification platform for multiple endpoints including iPhone, Android, Growl, Email, and a few more. Notifo has been my full-time job during this time. However, Notifo never gained enough traction with publishers or consumers to make enough revenue to pay the bills and sustain it as a company. As such, I have had to seek full-time employment elsewhere in order to pay my own living expenses. What does this mean for you and Notifo? Practically, it means that I will no longer be working on Notifo. For now, Notifo will continue to run as-is with no further plans for development but will probably be shut down as a result. I will try to keep it alive as long as possible, but please know that it could go away at any moment. I will do my best to provide at least 30 days notice before Notifo is officially shut down. I want to thank all of you for using Notifo. I’m deeply sorry about this result. There may be a few more posts regarding this situation. Please feel free to email me at [chad at notifo dot com] with any questions you may have. One last thing I would like to make clear: Untended blogs aren’t just a startup problem. I see established companies making the same mistakes. But established companies tend to have staff resources and budgets that makes it far easier to handle updates. And in almost all cases, they should know better than to let a product or company blog gather dust. I realize that other startup bloggers and consultants with expertise in content strategy may have different ideas about how to deal with some of the problems I have described above. Feel free to add your opinion in the comments at the bottom of this page. Image: C3, Cambridge Innovation Center. Photo by Ian Lamont.